DIVERSE INTERESTS—Male educators of color lead the annual spring PD academy organized by The BOND Project (Building Our Network of Diversity). Educators in Maryland’s Montgomery County Public Schools created the initiative to diversify the teacher workforce. A few years ago, Sharif El-Mekki discovered a difference between two groups of teaching colleagues: white women and black men. The fellowship has also arranged for black male college students to teach summer school. Black high school boys served as teaching assistants. Before starting a fellowshiplike initiative, administrators should gather together teachers and students of color to learn their perspectives. Using a survey could mask some of the reasons people of color feel uncomfortable in a district, he says. 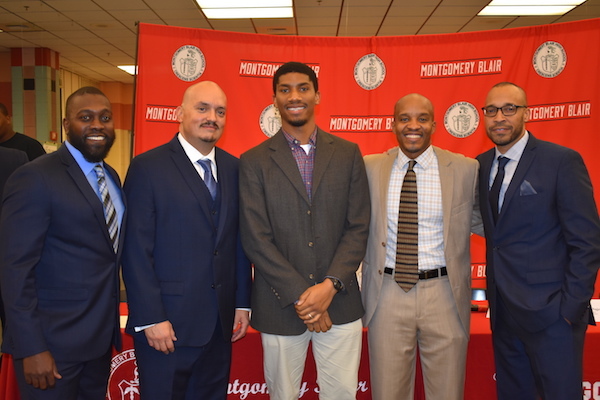 The underrepresentation of male teachers of color inspired a group of educators in Maryland’s Montgomery County Public Schools to design an initiative to reverse an inequity that impacts districts across the country. The BOND Project (Building Our Network of Diversity) develops recruitment, retention and mentoring strategies for a district where approximately 400 out of 13,000 teachers are African-American, Asian or Hispanic men. The project itself—and the career-spanning support it offers—serves as its own recruitment tool, says Daman Harris, a BOND leader and assistant principal at Wheaton Woods Elementary School. The BOND Project publishes research, organizes panel discussions, and holds a spring PD academy led by male educators of color. BOND also provides mentors to new teachers and even veterans looking for some assistance. Research increasingly shows that a diverse teacher workforce leads to improved test scores and graduation rates for students of color. It also reduces absenteeism and disciplinary issues. Diversity, in fact, benefits all students, says Desiree Carver-Thomas, a research and policy associate at Stanford University’s Learning Policy Institute. “Having people of color in positions of expertise and authority reduces implicit bias later in life,” she says. Administrators must focus on several components of the hiring process when diversifying teaching staff. Higher compensation attracts candidates who may have college debt and who may be doubtful about entering a profession in which they could make 30 percent less than other professionals with higher ed degrees, Carver-Thomas says. Minority teachers may also earn teaching certifications through alternative pathways. For example, teacher residencies allow candidates to work while attaining their degrees. Forging partnerships with higher ed institutions, and particularly with historically black colleges and universities, can build this pipeline, she says. To eliminate high turnover among minority teachers, administrators must create collaborative environments. “Think out job assignments carefully, so you’re not pigeonholing teachers of color into disciplinary positions or as language translators or as only teaching remedial classes,” she says. About a year ago, the Council of Chief State School Officers launched the multistate Diverse and Learner-Ready Teachers Initiative to help state education leaders develop and share strategies for developing a diverse, culturally responsive teaching corps. Participating states have each created a core team comprising a state policy leader, an education plan representative, a superintendent, a principal, a teacher leader, union representatives and legislators. These teams are now creating action plans that include PD for principals, revisions to HR practices and residency programs. Recently, a group of black students told Sparta Community Unit School District Superintendent Gabe Schwemmer that their rural Illinois school did not have enough teachers who looked like them. So Schwemmer created a teaching internship program for high school seniors who’ve already earned enough credits to graduate. Instead of sitting through extraneous classes, they serve as teaching assistants at the district’s school for preschool through eighth-grade students. This year, about 25 students are grading papers, monitoring classes, tutoring children and serving as role models for younger students. Two black students who participated last year have gone on to study education in college, Schwemmer says. “The students get job experience, and the teachers get the help they need so they’re less stressed,” she says. Districts of Distinction update: Lennox Elementary School's Schools of Engineering program is still moving full STEAM ahead. The Missouri school's technology students are working to make their classroom more interactive for students. The school's tech class is building CO2-powered dragsters students designed aerodynamically after performing sketches and research. Then they replicate those designs onto wood. Little Falls City School District’s standards-based Engineering by Design program strives to build students’ resilience while developing their real-life problem-solving skills.